Ive decided to do twelve bakes of christmas and to add a little twist (as I’m Welsh) they are going to be based on Welsh recipes so between now and Christmas my baking theme will be the twelve bakes of a Welsh Christmas. 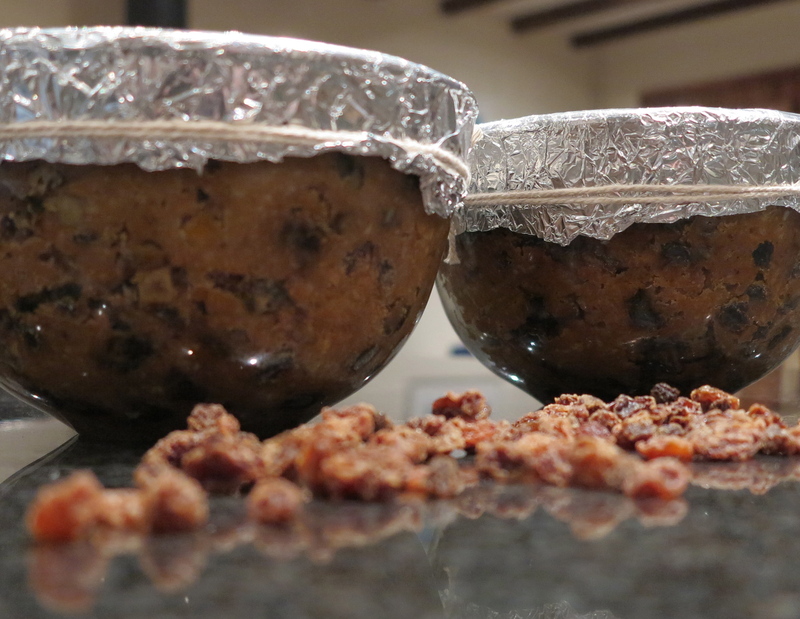 On the first bake of Christmas I made a Christmas pudding. I used Mrs Beeton’s recipe for a Christmas plum pudding (recipe number1328). Mrs Beeton’s recipes were very popular in Wales at the begining of the 20th century. This is an old recipe and you have work out some of the funny instructions like stone the raisins. We don’t have stones in raisins anymore and the candied peel is sliced so I didn’t have to slice it as the recipe said. It is usual to make the pudding before Christmas so that the pudding has time to age which means the flavours taste better. Once all the ingredients have been mixed together they are placed in a bowl a and covered with grease proof paper and tin foil to stop the water getting into the pudding when they are being steamed. Mrs Beeton’s recipe said to cover the puddings with a floured cloth but I think thats because tin foil was not available or it was very expensive item to buy. The puddings are steamed for five hours and then they are left till christmas day when they are steamed for another 2 hours before being served. This was a fun bake although it was hard work as you have to keep an eye on the pudding while it is steaming and five hours is a long time. It is traditional to put a small coin in the pudding mixture and the lucky person who gets the coin will get good luck for the year.